Could not resist: All credit to Xan Brooks (The Guardian) for his most excellent phrase "married alive" to describe this movie. 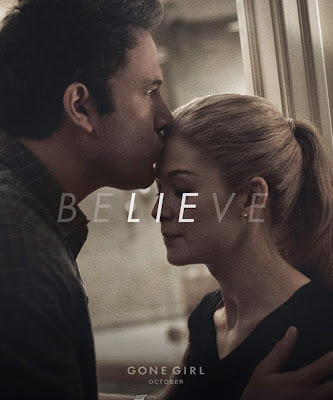 Unsparing, ambiguous and impalpable is that new David Fincher thriller "Gone Girl": With Amazing Amy's mysterious disappearance on the morning of her fifth wedding anniversary, possibly violently abducted, her husband Nick Dunne quickly becomes local authority's prime suspect. No matter how classic a crime exposition about a missing woman this starts out as, the narrative loomingly twists and turns into a veritably unnerving psycho-thriller. Beautiful Amy (Rosamund Pike) has always been a celebrity: Posing as her parents' source of inspiration from an early age, she was and always will be beloved Amazing Amy, the star of a series of children's books. In real life, Amy struggles as a writer, as does her husband Nick, and with a disease in Nick's family, the ivy-league New York couple decides to move to rural North Carthage, Missouri. Amy's disappearance — on the very morning of their anniversary no less — suggests Nick as a prime suspect. And no matter how much he insists on his innocence, he proves equally misleading and suspicious. The police finds evidence of Nick's luxury purchases financed by Amy's savings, significant credit card debt, a substantial life insurance to Amy's name. An incriminating diary appears the final nail in Nick's coffin: "This man of mine may truly kill me", Amy's blatant own words. Surprisingly Nick lawyers up and takes the offensive: Trying to persuade the police and the public of his innocence. The film's feintish screenplay was crafted by writer Gillian Flynn, based on her own 2012 bestselling novel. David Fincher, meanwhile — director of Se7en, Zodiac and The Girl With The Dragon Tattoo — long ranks as a virtuoso of his trade, among a handful of directors with such impeccable command of the full scope of cinematic narrative, masterfully juggling an inventive composition of comedy, crime thriller and satire for an enthralling, non-relenting two-and-a-half hours. A rightful, long-standing candidate for a Best Director Academy Award — who never ends up taking the trophy. The reason for this may just lie in Fincher's instinct for telling stories with dark appeal and hypnotic pace, films that are provocative and unconventional, yet manage with A-list casting and mesmerizing craft to remain barely within the spectrum of the cinematic mainstream. Gone Girl stands as Fincher's latest prime example of just this exceptional sensibility. "I was interested in the material because I loved Gillian's idea of narcissism, and narcissism in attraction," Fincher reveals in one of many great interviews preceding the film's release. "The idea that a person feels they're deserving of a certain type of spouse, and the degree to which people will build a façade in order to ensnare another person who's own façade seems like it's compatible. I liked how spouses find that, after three, four, five years, they get exhausted keeping up their end of the delusion." It is this, beyond the thrills of a well-told procedural drama, that makes Gone Girl an inconvenient, terrifying film, so vividly and elegantly rendered, yet revealing, haunting, and shockingly brutal. Once more Fincher magnetically aligns the talent of his cast and crew to deliver a masterpiece, sure to rank highly in the eyes of his fans. Fincher likes films that scar? Well, then Gone Girl could be Fincher's very own "Jaws" — adapted for marriages. I love how the whole "Mystery" get's basically solve in the middle film and I'm thinking, "Well now what?" It's like when John Doe gives himself up in Seven. And the key to each of these people who are essentially "Damage Goods" is how they handle the relationship with their parents. Nick moved back because his mother got sick and helps his father back to the home. Amy, well, she has a lot of contempt for her parents since they basically created the daughter that they didn't have. I'm not going to say who is clearly more damage by that relationship, but it's very obvious in the film.